Despite the intrigue of the fabric it was a joy to sew with. Sewing with knits has become so much easier now that I have my overlocker! This was a super quick make as well, I love it when a garment comes together quickly. I decided to self-draft the pattern. It's pretty much the same as the one I used for my black top only I descended it into a dress. 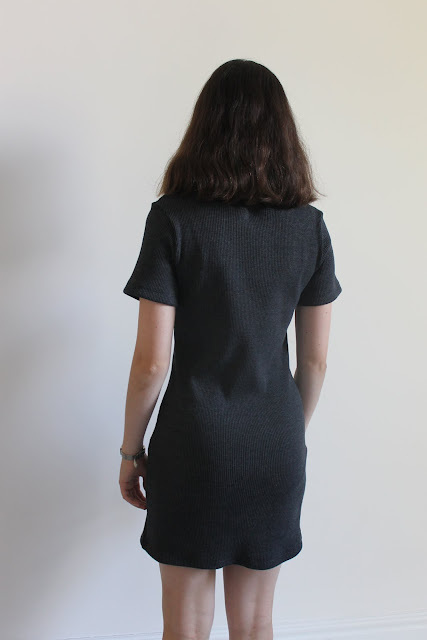 For the dress shape I used the Tilly and the Buttons Coco dress to determine where it should go in at the waist etc, but I minimised the A-line shape quite by quite a lot. As you can see by my previous version the Coco has got a striking A-line shape common with quite a few Tilly and the Buttons patterns. Personally, I'm not a fan of the shape and I much prefer the way this dress comes in rather than out. Although not visible in the photos the neckline has got a neckband around it. I really love the look of neckbands (although I love sewing them slightly less!) I just find that on jersey they give a cleaner and more professional finish to a bias bound neckline or simply turning the fabric under and topstitching it. I'm so pleased with this dress. 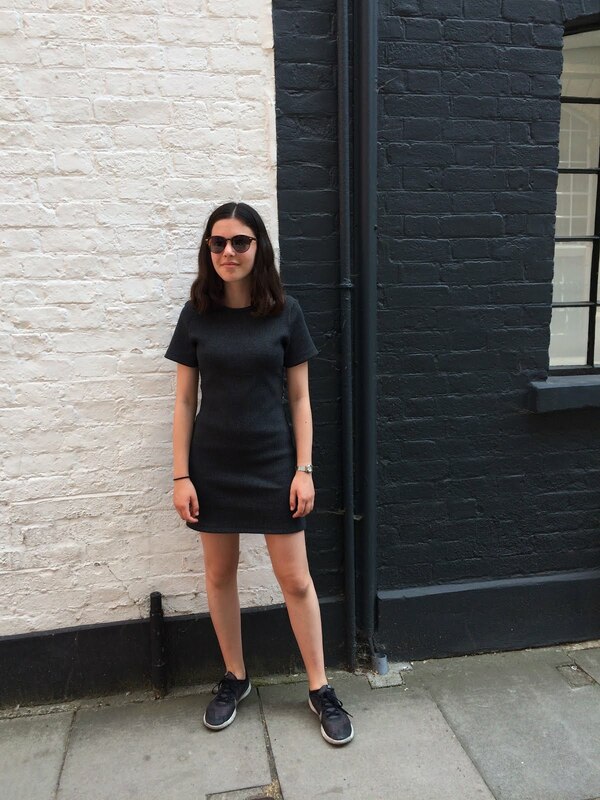 I had quite a strong view of what it should look like in my mind and often the finished garment can be not quite right when you have a strong opinion to begin with, but with this dress it came out exactly how I pictured it and I love that. I expect it will be a long time until I can wear it without tights again but hopefully I'll be able to wear it thoughout the colder months too with layering. This is a lovely dress that will be PERFECT for layering!! Fabulous! I love how you posed in front of the 2-color wall. This fabric sounds so interesting and made for the perfect dress! Bravo on drafting it yourself too! Wow, I really like this dress! The dress is great! I really like classic dresses! These are the best! Congratulations on a good job! Let as many such projects as possible.